Courtney Carver shows us the power of simplicity to improve our health, build more meaningful relationships, and relieve stress in our professional and personal lives. We are often on a quest for more—we give in to pressure every day to work more, own more, and do more. For Carver, this constant striving had to come to a stop when she was diagnosed with Multiple Sclerosis (MS). Stress was like gasoline on the fire of symptoms, and it became clear that she needed to root out the physical and psychological clutter that were the source of her debt and discontent. In this book, she shows us how to pursue practical minimalism so we can create more with less—more space, more time, and even more love. Carver invites us to look at the big picture, discover what's most important to us, and reclaim lightness and ease by getting rid of all the excess things. Courtney Carver launched her blog "Be More with Less" in 2010 and is one of the top bloggers in the world on the subject of minimalism. She has been featured in countless articles, podcasts, and interviews on simplicity, and is the creator of the minimalist fashion challenge, Project 333, which was featured in O Magazine and Real Simple. "Soulful Simplicity encourages conscious minimalism from the inside out. It's a heartfelt yet practical guide for making life simple again. Courtney's story is relatable in so many ways — she lets you walk in her shoes so you can see the mental and physical steps she took to escape a stressful life that literally almost killed her. This book has made me laugh, smile, and take action towards living a life uncluttered by most of the needless things people fill their lives with, leaving me with space for what truly matters. A life that isn’t constant busyness, rushing, and stress, but instead contemplation, creation, and connection with people and projects I love." "Courtney Carver reminds us that simplicity isn't just about being organized, it's about getting back to love. With simple genius, Marie Kondo taught us how to declutter our homes, now it's time to let Courtney Carver take us to a deeper place. To refine our lives, and reconnect with what matters most." "Courtney Carver’s new book Soulful Simplicity is a practical roadmap for embracing the beauty of less and making room in our lives for what matters most." 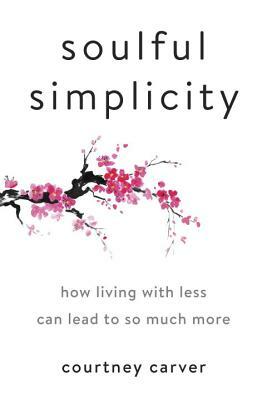 "In a world where so much of the messaging around radical simplicity is just about living with less stuff, Soulful Simplicity prescribes a lifestyle filled with a lot more of one thing: love. What our heart needs is a huge part of the equation, and Courtney teaches us how to make sure we're listening to it." "A gentle, compassionate guide to making more space in your home, more time in your day, and more love in your heart. Courtney’s personal story provides powerful inspiration to live a simpler, more intentional life." "Courtney Carver’s book is vulnerable and helpful. Courtney shows us that living simply goes beyond decluttering your closets and junk drawers. She gently illustrates that simplicity is the way back to connection, peace, good health, and love." "Soulful Simplicity is the kind of book you keep on your kitchen table so you can dip in when you have five minutes to yourself. I love how Courtney inspires the reader with her own story and then holds your hand through the process of making real change — the kind of changes you want to make. There are so many gems in this book!" "With humility, honesty and authenticity, Courtney Carver invites each of us to find greater simplicity in life–and provides a practical roadmap for us to find it in our own unique way." —Joshua Becker, Founder of Becoming Minimalist and Author of The More of Less. “If organizing your stuff worked, you'd be organized by now. Get this book for its strategic "how"s, and even more powerful "why"s.